With this third full-length, The Cold View packs a surprising breadth and variety into its Funeral framework. By comparison to previous releases, this third album by German solo project The Cold View comes with a positively garrulous press pack, explaining the underlying concept behind the trilogy of albums. Starting from a Nietzschean concept of viewing the world through cold and sober eyes, the debut 'Weeping Winter' focused on a personal view, the sophomore 'Wires Of Woe...' looked impersonally at the state of the world, and this latest 'Wounds' now turns that stare on fellow human beings. It doesn't explain the precise concept behind the choice of wounds to represent that, though the track titles cover the entire process of recovering from initial injury. Hemostasis is the stopping of bloodloss, inflammation deals with any infection, proliferation provides the cellular resources to begin rebuilding, epithelialization is the regrowth of skin, scarring arises from the thickness and disorganised nature of that regrowth, and maturation is the slow reduction of that visible and weaker initial closure. (Well, I knew the biology degree would come in handy at some point. It's only taken 30-odd years to find a use for it...). You could take that either way, as an analogy - the low, slow and largely unintelligible growls are not an illuminating factor - but my personal interpretation is that the premise is one where all interactions cause harm of some sort, and the key to managing them is how well and how completely recovery can be effected. It's quite a cold, stark and intrinsically negative stance, but one which wouldn't sit at odds with either the musical framework or The Cold View's previous output. As far as that's concerned, 'Wounds' is presented in much the same way as the previous albums - returning to GSP, as per the debut CD version - with a limited and unadorned 4-panel digipack carrying little more than basic credits. I can't help but feel the provision of lyrics, as per 'Wires Of Woe...', would have been a considerable enhancement, but perhaps the ambiguity of leaving things more open to the listener is part of band mastermind AAS's design. Musically - well, if you've run into either of the previous releases, you should have some idea of what to expect. The Cold View initially chose to occupy one of the bleakest boundaries of Funeral Doom and Drone: chill as the onset of Fimbulwinter, deliberate as an advancing glacier, inevitable as death and taxes. Much more so than its predecessors, though, 'Wounds' infuses the minimalist combination of a basic instrument set and voice with quite a breadth of variety. There's a partially cinematic atmosphere to it that lends 'Proliferation' the spooky soundtrack feel of The Undergrave Experience, and 'Epithelialization' that of a glacially-slow Summoning. There's a percussive Industrial vibe running through several of the tracks, countered by the ebb and flow between dreamy and hard-edged, slightly dissonant keyboards of 'Zeit'-era Tangerine Dream. There's even, on 'Scarring', an upbeat, almost-jaunty feel to the guitar leads: a brief respite and contrast before the tormented - but unusually, completely decipherable - and grim vocal presence of 'Maturation'. It's still very much a Funeral Doom album - the tectonic, hypnotic pace of the six tracks stretch it out to a full 74 minutes - but it's packing a lot more diversity into that than you might expect. So, though it's a long journey to the ultimate reveal and remembered agonies of the closing track, it actually seems to pass quite quickly: once immersed in the chilly depths of the compositions, it's easy to get drawn along through the changes of mood and emphasis. Sparse and uncluttered as they are, there's plenty of room to breathe - the instruments maintain a certain heaviness, without becoming oppressive, and the slightly hazy, indistinct and altogether less brutal mix nonetheless gives them space and separation over the background drone textures alternating between keys and guitar. It makes the voyage a strangely soothing - even cathartic - one, despite the harsher and more angular moments, and an entirely absorbing experience. 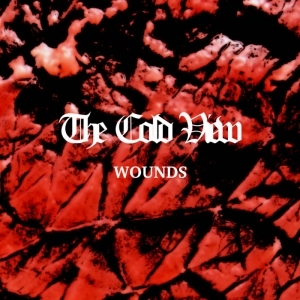 For all that, 'Wounds' does - in many respects - remain completely true to the cold, dark and distant core of The Cold View's previous works and ethos: paradoxically, much of the feeling it arouses is from a refusal to express much clear or blatant emotion of its own. As much as anything, it's the increase in both subtlety of palette and maturity of composition which simply allows a more nuanced personal interpretation and a greater accessibility to what is still far from the most comfortable of listening. It's cleverly done and well-executed, offering a very effective balance between challenge and reward throughout, and a distinct stride forward for the band. Highly recommended, even if Funeral Doom isn't generally your thing. Editor's note: The lyrics are actually available with the digital version of the album, downloadable from Bandcamp, and may also be accessed in booklet form or text form. They are worth checking, to get a fuller picture of the album.